We are frequently asked how are the oysters doing. 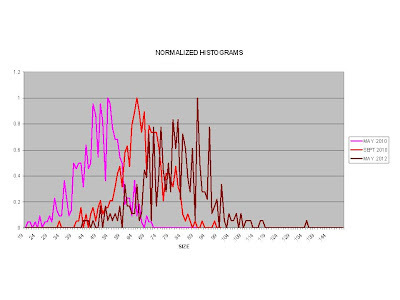 We will be checking on the oysters on the bottom later this week. But we do have some data to share on oysters that have been hanging int he water column. They have been their for two growing seasons and in that time we have seen them effectively double in size to an average of 80.3 mm. Total mortality has been 16.2% since we started late in 2009 and in the past year it was just under 5.7%. 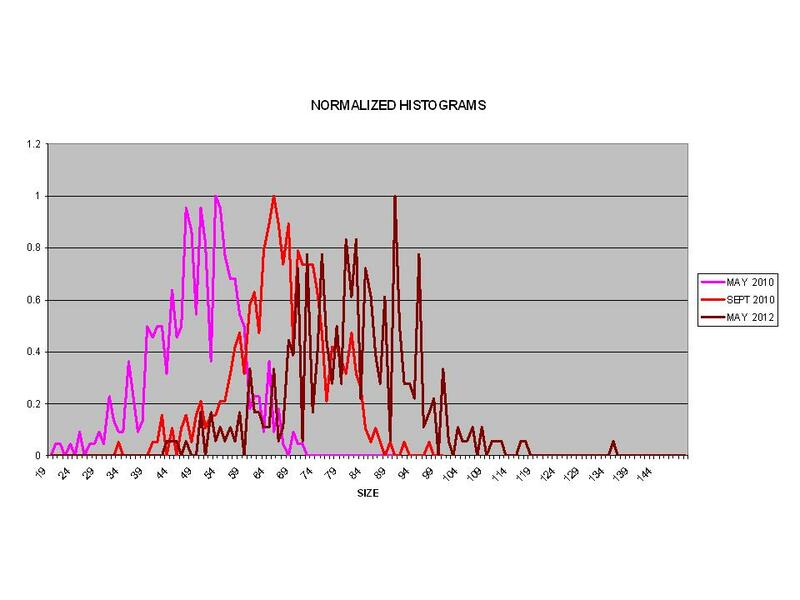 Interestingly, the mortality seems to be of oysters at the low end of the size distribution. Maybe they are small because they are sick. Maybe they cannot compete for food as well and die because they are small. Who knows? 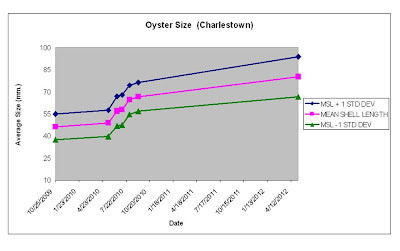 This year the average size of the dead oysters was 67 millimeters while the average size was 80.3 millimeters. We have the oysters tagged as unsafe for consumption and we are unaware of anyone taking any of the oysters. At the Marina, the boat owners understand that there are combined sewer overflows nearby and that this makes the oysters unsafe for consumption. Additionally, judging from the positive feedback. They seem to enjoy hearing about their status when we are measuring. This year, we shifted the oysters from milk crates to grow out trays to provide them with a better environment. Below is a photo of one of the milk crates. As you can see it is coated with mussels. 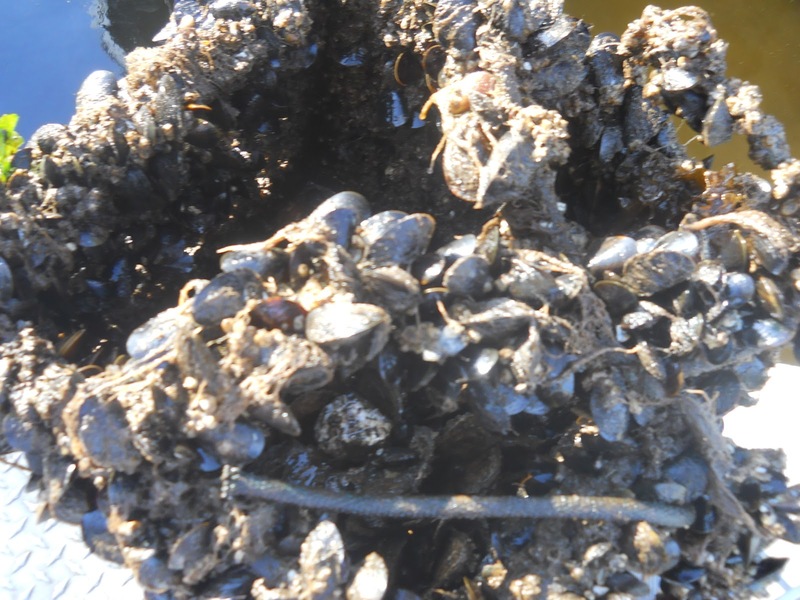 Some have said that the mussel is having trouble in Boston Harbor, but it does not appear to be the situation here. This is two stacked milk crates. There is a proliferation of mussels and the orange tunicates. A close up of the mussels. The oysters have effectively doubled in two years. Since we are drawing contributions from a broader and broader catchment area and since this appears to be an exciting initiative providing valuable data. The MOP Board voted to award a grant of $2000 to the town of Wellfleet for their oyster restoration work. While Wellfleet has a healthy and well-known oyster industry, the natural reef is largely gone. This restoration effort at the mouth of Duck Creek consists of placing shell and allowing for the naturally existing spat (young oysters) to settle on it and grow. The MOP Board is particularly excited about this effort as the goal is to create reef and to measure the improvement in water quality. 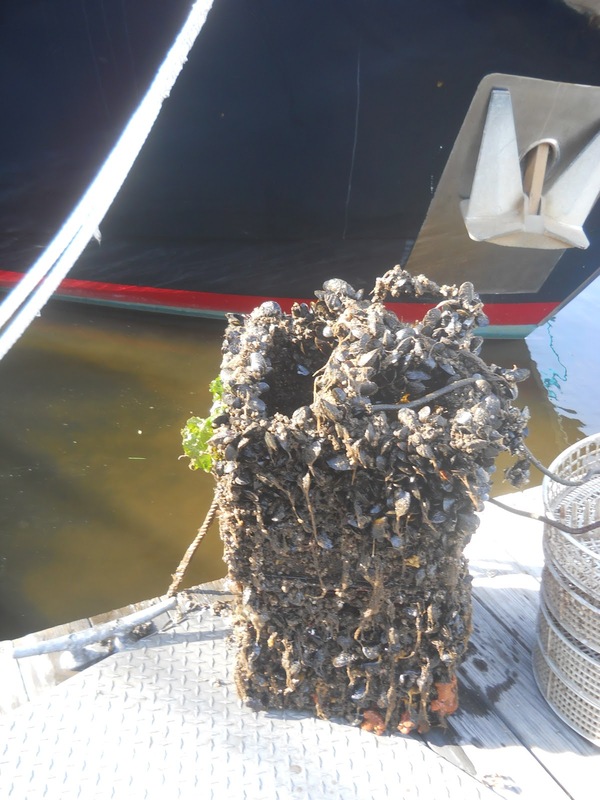 A number of other Cape towns are interested in using oysters for nitrogen removal including Mashpee and Falmouth.